I was so excited to see Louise Kirby's nature study journal in my mailbox. I felt instantly inspired and got to work. I had been working in my garden and had collected some feathers which I used on my first entry and included some quotes from one of my favorite poets, Mary Oliver, and one of my favorite composer/singer Leonard Cohen. 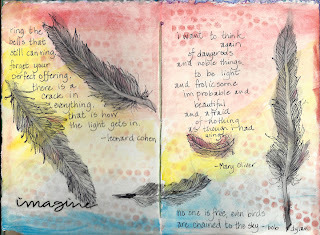 I throw in the Bob Dylan quote just because it worked so well. I also think it is pretty incredible how small the world can be. 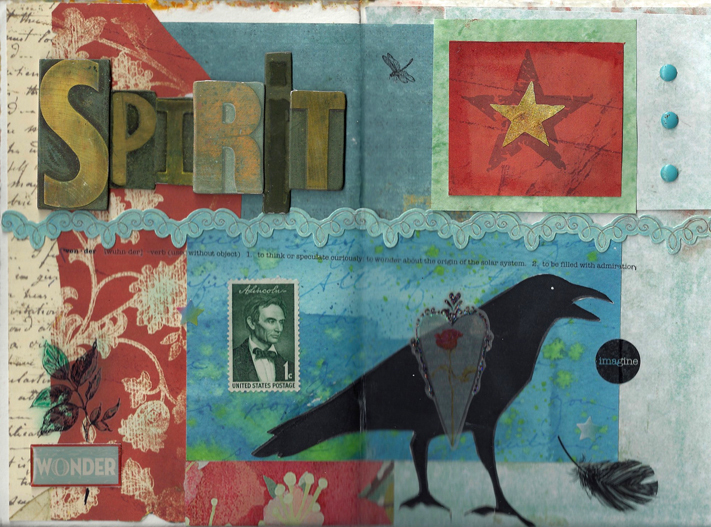 I participated in Shannon Ganshorn's International Mixed Media Postcard Swap where you make 10 postcards and receive 10 postcards. Well, you can imagine my surprise when I got a small envelope made from an old calendar (very cool) not only filled with a wonderful postcard but Australian postage stamps and paper. Next I got an even bigger surprise. The package was from Pam Parker who just happens to be Louise's mom! How cool is that? So Pam's wonderful gift became my inspiration for my next entry. I am the only American in the group, but I do not want to make the entry too patriotic looking. I live in Illinois which is known as the Land of Lincoln so the postage stamp was where I started. I have a great relationship with a female crow and being out in nature feeds my spirit. 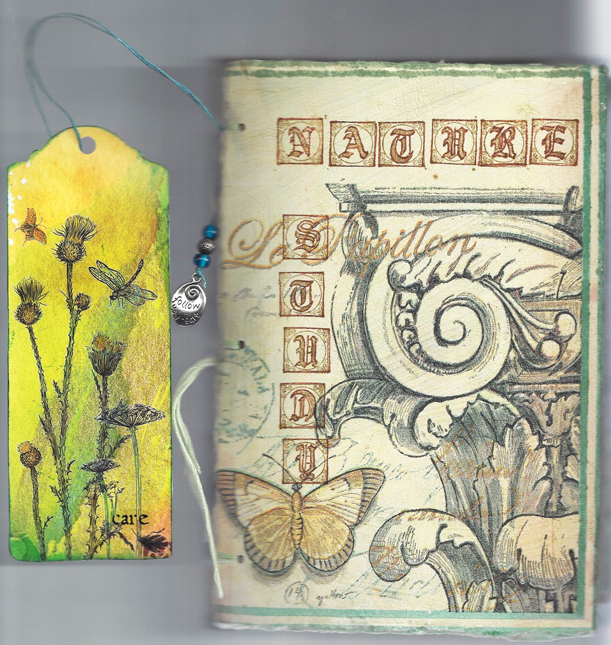 After I mailed the journal off the last time, I thought it would be fun to add a bookmark and kicked myself for not having made one. 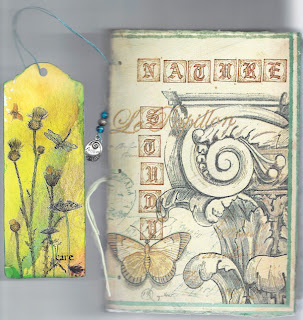 Didn't want that opportunity to slip by so I created a bookmark using a recycled part of a calendar, some rub-ons, colored pencils, markers and a stamp pad. It's now attached to the journal. I feel such an honor to be able to share this journey with Louise and Helen. It has truly been a lot of fun and a great learning experience. Karen I am so touched by your words and your beautiful art, I was so thrilled to get my parcel from you today- it was wonderful and healing from the envelope decoration alone and just got better and better and I am so glad you have 'met' my lovely mother- the art world is such a nourishing and supportive community and I am so glad we have all connected. Thank you Karen for your beautiful contributions. Your entries in Louise's journal are very beautiful thank you for your kind words, I am so happy that my small effort gave you some pleasure. Perhaps it will happen again, who knows.